While Carl's Jr. isn't offering breakfast all day (at least not yet), the chain will now offer their Breakfast Burger all day long. First introduced in 2004, the Breakfast Burger consists of bacon, egg, hash browns, a charbroiled beef patty, American cheese, and ketchup on a toasted sesame seed bun. It was previously only available during breakfast hours. The Breakfast Burger costs $4.39 with a single patty, $5.69 for a double patty, and $5.69 for a 1/3-lb. Black Angus patty (may vary). It's also available with fries and a drink starting at $6.79. 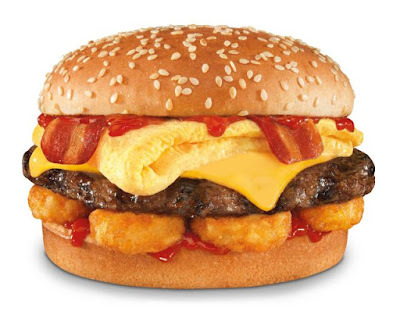 To promote the change in availability, Carl's Jr. has a buy one, get one free coupon for the Breakfast Burger up on their website (good through early March).